The episode 5 of The Moon that Embraces the Sun broadcast on January 18th, 2012, tells the story of Yeon Woo (Kim Yoo Jung) is expelled from the palace due to illness and the worries of her family. On the day’s episode, Yeon Woo’s father, Heo Young Jae (Sun Woo Jae Duk) decides to send away his eldest son, Heo Yeom (Lim Siwan) who is also the teacher of crown prince Lee Hwon (Yeo Jin Goo) to his uncle’s home. Because his father’s insistence, Heo Yeom decides to leave home, and entrusts his younger sister Heo Yeon Woo to Seol (Seo Ji Hee). The episode portrays the sad farewell scene between brother who is sad because cannot protect younger sister, and younger sister who sends off elder brother in tears. But, in this tear-jerking scene appeared an ironic goof. 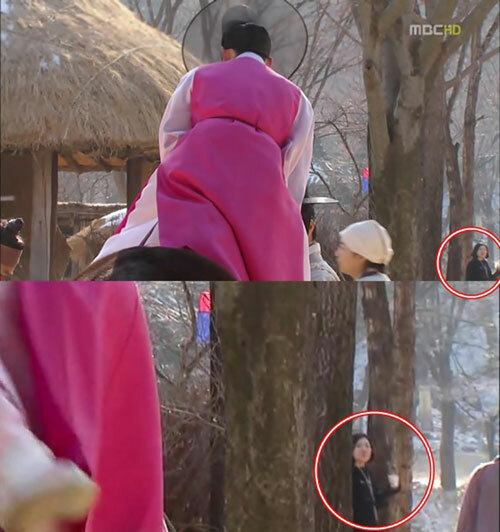 At the far end of the scene, a visitor who seems to be visiting the folk village that the filming took place appeared on the screen, with something around her neck and hand holding a coffee. Seeing the anachronism goof, netizens said, “So there is coffee-drinking woman in Joseon Dynasty,” “That person was also seriously looking at the filming scene,” “This is a drama full of problems,” response was overwhelming.